People participate in a "freeze mob" in San Francisco on World Kindness Day (Nov. 13, 2016). Sunday just so happens to be World Kindness Day so folks from around the world participated in a flash mob and freeze mob to celebrate the occasion. 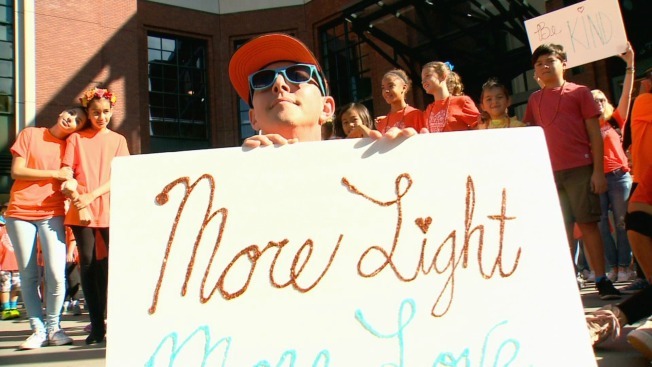 In the Bay Area, joyous participants gathered at Willie Mays Plaza outside of AT&T Park to spread a little bit of love, especially during a time in which the nation strives to heal from a contentious election season. Life Vest Inside organized the "Dance For Kindness" event, marking the fifth such time people have gathered in unison to encourage human kindness. Roughly 12,000 participants from at least 50 countries spanning the planet joined in for last year's festive dance party, according to Dance For Kindness organizers.